Kiwi pacer Trent Boult career-best figures of 6/30 bundled out Sri Lanka 104 on day two of the second Test in Christchurch on Thursday. New Zealand vs Sri Lanka 2nd Test Christchurch: New Zealand pacer Trent Boult literally toyed with the Sri Lankan batting unit as he wrapped up the visitors with a furious spell of swing bowling on day 2 of the second and final Test at the Hagley Oval in Christchurch. Boult took six wickets in space of just 15 balls while giving 4 runs to bundle out the Islanders for a meagre 104. From an overnight 88/4, Sri Lanka suffered a collapse of epic proportions to hand New Zealand a first innings lead of 74. Lanka’s most experienced player Angelo Mathews remained unbeaten but he has lost all his partners with a sensational and never-seen like before spell of fast bowling. The touring side resumed the day at 88 for four with the in-form Angelo Mathews unbeaten on 27 to give them a slight advantage as they closed in on New Zealand’s first innings 178. But after adding six to their overnight total, Sri Lanka crashed when Boult unleashed his lethal attack and their innings was over just 45 minutes into the day. 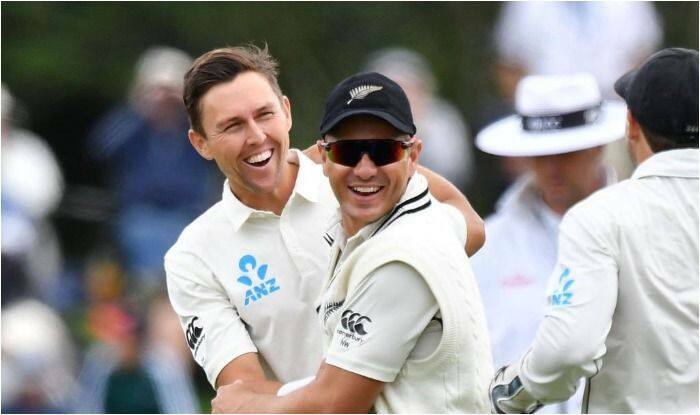 Boult, who sent down 10 overs without reward on day one, finished with a career-best six for 30 off 15 overs, eclipsing his previous best of six for 32 against England earlier this year. The onslaught began with Roshen Silva (21) and Niroshan Dickwella (four) both caught at third slip by Tim Southee while Dilruwan Perera, Suranga Lakmal, Dushmantha Chameera and Lahiru Kumara all went lbw without scoring. Perera and Lakmal fell in successive balls with Chameera surviving the hat-trick only to be trapped in front on the second delivery he faced as Boult’s precision swing proved too much for the tourists. Mathews, who defied New Zealand for so long in the drawn first test with innings of 83 and an unbeaten 120, was left on 33 when he ran out of partners. With more than an hour of batting time before lunch, Jeet Raval (23) and Tom Latham (11) put on 36 without loss. Lakmal, who was Sri Lanka’s hero with the ball taking five wickets in New Zealand’s first innings, found plenty of movement but could not capture a wicket as his six overs produced a miserly five runs.